water bottles and bandannas from a child’s birthday party. Sure, on their own, each one of these items can be useful. I’m not going to argue with that. A water bottle, a bandanna, a back pack, a tote bag, a t-shirt – all these items can be useful. But I went from having a just-right number of water bottles to having an explosion of them. My kids have backpacks, and each one lasts for two school years. I’ve already decluttered a half dozen bandannas; now I have more. As for t-shirts, let me just say that when I started decluttering, my husband had 100. What’s a declutterer to do? First off, I try to leave these things behind when they are offered to me. Yes, you might have to step out of your comfort zone to say “no thanks” rather than just accepting what’s handed to you. This helps with clutter, but unfortunately, there is still the larger environmental impact of that item’s existence. We don’t need these things (or even want them), and the fact that they exist means that the raw materials have been gathered, and they have been manufactured, transported, etc. – a waste of perfectly good energy. To make my small impact on these larger issues, I have resisted gifts more and more. (As Colleen once wrote, Don’t the very words “stocking stuffer” = “unnecessary item”.) If it’s not truly a want or need of someone in the family, we don’t buy it. We make gifts. I shop at the thrift stores, Craiglist, and Ebay first; local stores next; the mall last. This year I vowed to give no material gifts to my children’s friends. For my own friends, with whom I rarely exchange gifts anyway, I give something very practical, like a homemade frozen meal. (Way more appreciated at Christmas time than more candy or a Santa trinket, I guarantee you!) If there’s nothing I really want, I ask for a gift certificate to my favorite online store, Amazon.com, where I can buy practically anything when the need does arise. When did “I love you and value your friendship” start to equal “so I’ll give you some cheap crap to show it”? Or “I’m so grateful that you came to my conference that I’ll load you up on items you can’t possibly use” become a standard business practice? Only by becoming conscious of choices in all areas of our lives can we start to change and to change the people around us. I know I’ve had an influence on my friends and on you, our readers, and I know you have too. Let’s be like water on a pond sending ripples of wisdom outward instead of thoughtless consumers of more, more, and more. *For those of you who are not native English speakers, an oxymoron is a figure of speech where two apparently opposite ideas are paired. I have looked forward to this day from the very beginning of my declutter mission and it has finally arrived. This is the hutch section of an entertainment unit that is no longer suitable to fit the TV into. It is big and dark and bulky and held a lot of stuff I never really used or loved. By slowly decluttering spaces in the bottom section of this unit, in the kitchen cupboards and the bookcase it is finally empty and a man named Brian will be recycling it to create other pieces of furniture. It was picked up today by Brian and his brother Bob and I am glad to see it go. Something that made me laugh ~ My husband poking fun at our daughter because her favourite baseball team lost again today. It is an ongoing love hate relationship between them during the baseball season, mostly love though of course. Something Awesome ~ Learning to say no when you really don’t want to do something. Something to be grateful for ~ The three people who picked up Freecycle items from me today. Something that made me happy ~ How light and airy my living room looks without the big display cabinet. Something I found fascinating ~ Watching the big storm front build up to the north today. It is now rumbling overhead. Weather is interesting and so different here than it was in Seattle. « Where is the light at the end of the tunnel? I was going to freak out WAIT WAIT, my parents gave me jumper cables for the car for my birthday – exactly what I asked for! I couldn’t agree with you more! I am so sick of these kind of items too. I think the most ironic and unfortunate one is the synthetic tote bags given by stores to replace “paper or plastic.” They are supposed to be more eco-friendly, yet the proliferation of these totes makes me think they are gaining on the number of plastic bags, and are definitely an item of rubbish themselves. They don’t last forever, and then they become an item for the landfill. My trunk is filled with them — more than I can possibly use for my groceries. I’d like to throw them away but that makes them just as bad as a plastic bag. Sigh. Hi Eve, I’m not sure where you live, but the tote bags in our area are made of recyclable material. Have you checked the label on yours? Just a thought. 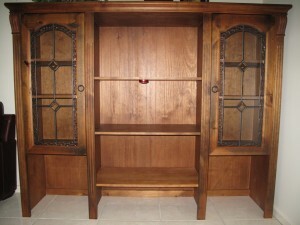 Wow, what fun to be able to get rid of a huge display cabinet! Even Hallmark gets in on the “usable gift” thing. We usually buy cards for a month’s worth of family birthdays and anniversaries at a time. Because we buy several at a time, we usually always qualify to receive the free stuffed animal they give away with a certain number of card purchases. It used to be that I’d always politely tell the cashier “No, thanks” when she offered me the free stuffed animal, but my husband would tell her yes, and he’d bring it home with us. After several times of him struggling to think of somebody he could give the stuffed animal to, he is now starting to get better at saying “No, thanks” too. To those looking to recycle backpacks and such, we can always use them at school for our homeless students, and the women’s shelter can always use them as well. So look for places where people have temporary needs and can use them. Unless you can just not receive them in the first place. I’ll be looking for more places to say NO! Thanks. I love the idea of frozen meal as a gift. Who could not use a homemade meal to pop in the oven on a busy night. And since it was prepared by hand the recipent will know that you cared enough to spend the time making it. Great idea. I just went to a seminar and could have come home with a entire bag of pens, notepads, coin purses, keychains, etc….I left it all behind. Who needs all of this stuff. Congrats on getting rid of that big entertainment center. I know you will enjoy having that much space. Hey Everyone, Thanks for your positive comments. When I wrote this, I felt like I was ranting and raving, but apparently I was preaching to the choir! Oh how right you are. Another one is people who go on vacation and bring back little “trinkets” to give their friends. Thanks for thinking of me but no thanks. I don’t want another keyring or plaque or whatever. The idea of a frozen meal is wonderful. I wish others would try that. If you want to give me something give me a meal or a gift card. But most of the time just give me a big hug, say “I love you” and I will be happy as can be. Vacation trinkets – Yes, my in-laws used to always bring back t-shirts. So unnecessary. all its doing is cluttering up my life and if I throw it in the bin then thats just making landfill!!! it is all very annoying isn’t it. It actually puts people off ever donating to anything. With half of them selling your information on and the other half cluttering up your house. What is a person to do. A few years ago I decided to give a small, living annual flowering plant instead of birthday cards to my friends… “here’s your card” I say as I pass it to them. They get a living bit of colour for their house or garden, and then they can either let it die or pass it on if they grow tired of it. Also we don’t buy presents for each other. Once a year my dearest school buddies and I get together from all our respective towns to a central place and have a really nice meal: there is no clutter, no gift-guilt and always great memories to go along with our “unbirthday” experiences! I like it. Two close girlfriends and I usually go out to lunch and shopping at our favorite thrift store for our birthdays, although what ends up in my basket has shrunk considerably in the past year! We still have fun. One of our favorite parts is trying to find the ugliest t-shirt or the most ridiculous shirt. Once we found one that looked like a tiny one-shouldered demin skirt. A classic! Love both these ideas – I have been on the receiving end of the plants (perennials) which helped me to fill out my garden and come up every year. These sound like great items to give away to a shelter, most of them anyways. I have a friend who keeps backpacks stocked with some toiletries and packaged foods in her car to give away when she sees someone in need. Most of my friends and I have agreed to stop giving gifts and get together for a nice meal instead. And I share wish lists with family and ask them to do the same so the gifts are useful and not clutter. Your friend is very thoughtful, and I second your idea of getting together for a meal. We need to eat anyway, why not do this with the people we care about and make a good memory every time? Maybe this is a practice that will fade with time – and the more of us who refuse the give-aways, the louder the message will be to organizers. Some people still love this stuff though. It may take awhile. Hi Cindy! I like giving gifts, but if you really want do give something useful you should call the person, and ask outright what she/he needs. I only do that with the closest of the closest. Or when I am invited to a birthday party, which is very rare. So I call and ask: what you need within “x” value? If it is clothing, I ask if the person likes so and so place. Then a get a gift certificate and the person can go and get whatever he/she needs. This idea really works for me. I gave my sons a big birthday party and invited my friends and children. Everyone asked me what I wanted, clothing or toys. I answered clothing and now, I had a wonderful party, and my boys have clothes for the winter, and I don’t have to buy them. I know many people consider it rude to ask or saying what you want, but I have always got exctly the gifts I really needed and everyone I gifted this way would came to me and say they went and got something they chose and really wanted. Granted this will not work for everyone. But for those who are close, but you can’t gift everyone, going out for a meal and sharing a few laughs are ideal, as Cindy put it. In my immediate family, giving extremely specific gift suggestions “second shelf, left-hand side, it will be on sale next week” is not considered in bad taste, but I think we might be in the minority. I’m glad this worked for you and that your friends and family are OK with this system of gift giving. In a year I visited about 3-4 medical congresses. Everyone gets a bag or a backpack at each congress. When I left in the evenings I always saw a lot of large trash cans filled up with these bags. When we started our own congresses we couldn’t do it better. We needed the money of the sponsors and they insisted on distributing clutter. Most people find it great to get things at the beginning, and then it stars to become mostly annoying. Birthday gifts are no problem for me. I tell the date to no one. My family and my closest friends are happy to recieve a wishlist. I HATE the freebie advertisement junk disguised as “usable gifts”. I say NO, NO, NO THANKS! I have gotten baffled looks when someone clearly excepted a delighted response at getting the freebie XYZ and I politely declined. And this stuff will only diminish from the world when enough people start declining it. Might take a while. I am firmly on the “don’t accept freebies” camp on this issue. I would probably accept if it was something useful but they rarely are. I used to love tasting samples at Costco when I lived in the US but I am so over reusable shopping bags, over-packaged samples, pens and all the other environmentally unfriendly offerings that are thrust at me. If we keep on accepting them they will keep on thrusting them upon us regardless of how much airtime global warming, carbon footprint and the fuel crisis get. It is as though these companies are oblivious to the fact that the production of these items is a waste of resources and energy. I hear this . If we get one more pointless backpack and pencil case for making deposits in my daughter’s bank account, items that go straight to the charity shop, I will scream. I don’t know how old you are but I remember getting Skippy the Kangaroo money boxes when we did school banking when I was a child. And I have to admit I did love it when every cereal box came with a toy in it but I am a lot older and wiser now and they were the only toys we got outside of birthdays and Christmas. I completely agree with you, Cindy! Unless the “free gift with purchase” is something I actually need ( and that’s rare), I decline it. The salesperson is nearly always bewildered and sometimes tries to talk me into accepting it (“but it’s free!”). If it is something I need that has a hideous logo, I usually look to see if the logo can be unstitched or scraped off, and then I might decline it on that basis. I will keep Delores’s suggestion, that one can donate a useful item like a sturdy backpack, in mind in future.